The combination of more and more airtight buildings and the emission of formaldehyde and other volatile organic compounds (VOCs) by building, decoration and furniture materials lead to lower indoor air quality. Hence, it is an important challenge for public health but also for the preservation of cultural heritage, as for example, artworks in museum showcases and other cultural objects. Indeed, some VOCs such as organic acids or carbonyl compounds may play a role in the degradation of some metallic objects or historic papers. Thus, simple and cost effective sampling tools are required to meet the recent and growing demand of on-site diagnostic of indoor air quality, including emission source identification and their ranking. In this aim, we developed new tools based on passive sampling (Solid-Phase Micro Extraction, SPME) to measure carbonyls compounds (including formaldehyde) and other VOCs and both in indoor air and at the material/air interface. On one hand, the coupling of SPME with a specially designed emission cell allows the screening and the quantification of the VOCs emitted by building, decoration or furniture materials. On the other hand, indoor air is simply analysed using new vacuum vial sampling combined with VOCs pre-concentration by SPME. These alternative sampling methods are energy free, compact, silent and easy to implement for on-site measurements. They show satisfactory analytical performance as detection limits range from 0.05 to 0.1 µg m−3 with an average Relative Standard Deviation (RSD) of 18 %. They already have been applied to monitoring of indoor air quality and building material emissions for a 6 months period. The data obtained were in agreement with the prediction of a physical monozonal model which considers building materials both as VOC sources and sinks and air exchange rate in one single room (“box model”). Results are promising, even if more data are required to complete validation, and the model could be envisaged as a predictive tool for indoor air quality. This new integrated approach involving measurements and modeling could be easily transposed to historic environments and to the preservation of cultural heritage. On-site sampling of VOCs material emissions by using an innovative passive device (DOSEC). The impact of building and decoration materials on indoor air quality (IAQ) is now well known and recognized [1, 2]. For many Volatile Organic Compounds (VOCs) found in indoor environments (formaldehyde, α-pinene,…), the main sources are located inside the building . Moreover, the development of low energy buildings which promotes more and more airtight constructions tends to raise indoor pollutant concentration levels. Therefore, indoor air quality became a major public health issue and, in France, a new legislation was implemented. The labeling of all building materials according to their emissions of VOCs is effective since 2013 (decree 2011-321, 23 March 2011), and the compulsory measurement of some pollutants in public buildings (formaldehyde and benzene) is being considered. In the near future, museum and libraries might be concerned. The preservation of cultural heritage is also challenging as VOCs and carbonyl compounds may damage artwork exposed to the confined atmosphere of showcases. In this context, relevant tools are needed to perform on-site indoor air diagnosis, including emission sources identification and monitoring. The proposed methodological approach includes a diagnosis step involving new methods relying on passive solid-phase microextraction (SPME). This technique is particularly relevant for sensitive environments (e.g. historic buildings, showcases displaying artwork, etc.) because it is non-invasive, easy to use and noiseless. Two SPME sampling methods were developed to study nine VOCs, both in indoor air and at the material/air interface [4, 5] for highlighting and quantifying emission or sink effects, and then identifying and ranking material sources. The ability to measure in situ the surface concentration of building materials allows to predict the indoor air quality by modeling approaches. The model developed here was adapted from box models which were the most widely applied to indoor environments . As a decision support tool, the model could help in the selection of low emission materials and the optimization of air exchange [7, 8]. This methodology was applied to recent buildings and some examples are presented in this paper. If the first applications aimed to support IAQ management in household and public buildings, the methodology could be easily transposed to cultural heritage issues. These examples can address libraries, museum or galleries which can be placed in new buildings. In this case, indoor VOCs differ from VOCs in old buildings but may also influence the preservation of cultural objects. VOCs are concentrated on a SPME fibre which is then directly desorbed into the injector of a gas chromatograph (GC) coupled to mass spectrometry (MS) for analysis . A PDMS-DVB SPME fibre (Supelco, Bellafonte, PA, USA) treated with O-(2,3,4,5,6-pentafluorobenzyl)hydroxylamine hydrochloride (PFBHA) was especially developed for GC–MS analysis of carbonyl compounds including formaldehyde . As SPME is a passive sampler, the amount of pollutants adsorbed on the fibre is directly proportional to the product of the concentration of the pollutant and the exposure time, product which is called “exposure dose” and expressed in µg m−3 min [11, 12]. Air sampling was performed in 250 mL glass vials provided by Entech Instruments (Simi Valley, CA, USA) equipped with SPME-adapters [13, 14]. The vials were cleaned with wet nitrogen and evacuated until 10 mtorr before sampling thanks to a 3100A Canister Cleaner (Entech Instruments). On site, they were filled with air and then stored no longer than 2 days at room temperature (20 °C). Then, the SPME fibre was introduced into the vial for 20 min prior to its thermal desorption and analysis by GC–MS. where F is the emission rate of the target VOC (µg m−2 s−1), D, the diffusion coefficient (m2 s−1), C a the concentration in indoor air (µg m−3), C as the gas phase concentration at the material surface (µg m−3), L the thickness of the gas phase boundary layer (m). In this study, the passive sampler was a home-made cylindrical glass cell inspired by previous work . This “Device for On-Site Emission Control” (DOSEC) was optimized for SPME coupling and will be fully described in future papers. The sampling involves two steps: first, VOCs diffusion from the material to the gas phase (DOSEC headspace) and second, after introduction of SPME fibre in the DOSEC, the VOCs transfer from the gas phase to the fibre coating. Assuming equilibrium is reached in the DOSEC, the headspace concentration could be assimilated to the gas phase concentration at the material surface, C as (Eq. 1). Thus, the data measured is the concentration at the material/air interface expressed in µg m−3. After sampling, the fibres were then stored up to 3 days in stainless steel tubes  and were analyzed by GC–MS. The SPME fibres were analyzed on a Varian 3800 gas chromatograph coupled with a 1200Q quadrupole mass spectrometer (MS) (Varian, Les Ulis, France). The PTV injection port was equipped with a 0.75 mm i.d. liner and was operated at 250 °C. Acquisition was made in single ion monitoring (SIM) and scan modes. The method was especially developed to identify and quantify nine VOCs which were selected from the compounds listed in the French regulation for material emission labeling (decree 2011-321, 23 March 2011). As buildings and showcases may contain wood-based materials, hexanal and α-pinene were included in the compound list. The target VOCs were: formaldehyde, acetaldehyde, toluene, tetrachloroethylene, p-xylene, 1,2-dichlorobenzene, styrene, hexanal and α-pinene. The mass-balance model aims to simulate average indoor air pollutant concentration as a function of outdoor concentration, building characteristics (volume, air exchange rate…) and indoor sources/sinks. It is a single zone model which considers the room (or other closed environment) as a zone where pressure, temperature, and pollutant concentration are homogeneous. The mass balance of a VOC i is written according to the following equation (Eq. 2) where materials are considered both as VOC sources and sinks from indoor air. where C i is the average indoor air concentration of the pollutant i (µg m−3), Q ij the contribution of the material j to the IAQ (source or sink of pollutant i) (µg m−3 s−1), λ the outdoor air exchange rate (s−1), C iout the average outdoor air concentration of pollutant i (µg m−3), t the time and m the total number of materials within the room. In Fig. 1, C sij is the air concentration of the pollutant i at the surface of the material j. Buildings and rooms studied—a meeting room; b classroom; c living room. where h ij is the convective mass transfer coefficient of pollutant i through the boundary layer over the material j (determined from empirical relationships  ), A j the surface area of the material j and V the volume of the room. Air exchange rate was determined from the elimination kinetic of injected CO2 according to the method described in ASTM standards . Three new buildings (or constructed less than 2 years before the measurement campaigns) were studied: a meeting room in an office building (Fig. 1a), a classroom in a high school built according to the HQE® (High Environmental Quality) French label (Fig. 1b) and the living room of an unoccupied and non-furnished house (Fig. 1c). All the buildings are located in the south west of France and measurements were made when the rooms were unoccupied in order to only consider material sources of VOCs. The high school, which is studied here in details, is located in a rural area, near a pine forest. The presented results will mostly concern the classroom for which the sampling campaigns began just after the building delivery, and took place every 2 weeks over a period of 6 months. The Table 1 presents the building materials and the furniture of the classroom. 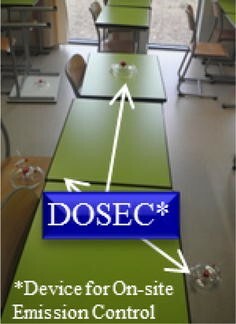 All the VOCs surface concentrations were determined using the DOSEC, indoor and outdoor air were sampled using the vacuum vials. All the building materials were rated “A+” by the new French regulation on sanitary labeling (including exposure concentration less than 10 µg m−3 of formaldehyde). The limits of detection (LOD) and of quantification (LOQ) (Table 2) were determined for the target VOCs analyzed by GC–MS. LOD and LOQ were evaluated for a signal to noise ratio of 3 and 10 respectively. They correspond to 20 min extraction of standard gas in vacuum vials. It can be pointed out that the DOSEC performance is comparable to that of the vial as the device volumes are similar. All the LOD and LOQ were below the µg m−3 level and the average RSD (relative standard deviation) for 6 replicates is 18 %. SPME air sampling was compared to standard methods for three model compounds (formaldehyde, α-pinene and styrene) identified in the indoor air of the unoccupied house. The temperature was 17.6 °C and the relative humidity 64 %. For formaldehyde, the standard method consists in active sampling on a cartridge filled with Florisil® treated with 2,4-dinitrophenyl hydrazine (DNPH) which specifically reacts with carbonyls. The cartridge is eluted by acetonitrile and the resulting extract is analyzed by high performance liquid chromatography equipped with UV detection (HPLC–UV) . For the other VOCs, active sampling is carried out on a Tenax® tube further analyzed by thermal desorption coupled to GC–MS . Results presented in Table 3 show that there is no significant difference between SPME and standard methods for the compounds investigated. Therefore, SPME is relevant and could be considered as an alternative to standard methods, even if a full validation should be further performed. C concentration, SD standard deviation, n number of replicates. As formaldehyde is an important pollutant of indoor air, the presented results will focus on this compound. The Fig. 2 presents the identification of the formaldehyde material sources in the classroom studied. The surface concentrations obtained by DOSEC sampling are reported for each material at the beginning of the sampling campaign (September 2012) and at the end, 6 months later (March 2013). The lines indicate the indoor air concentrations for the two sampling periods, showing a factor two decrease within the first 6 months after the building delivery (from 13.5 µg m−3 for September 2012 to 5.5 µg m−3 for March 2013). Material emissions, which are the main sources of VOCs, also significantly decreased during this period. As expected, formaldehyde is mostly emitted by wood based materials. The surface concentration of the desk underside is particularly high (125 µg m−3). The high emission of the interactive board (125 µg m−3) is more surprising: this can be explained by its coating made of melamine resin which contains formaldehyde. Another unexpected result is the emission of the PVC flooring which normally does not emit formaldehyde. It is supposed that the adhesive or other products (underlayment…) used for the floor are responsible for this emission. This result demonstrates that it is important to perform in situ surface measurements in order to take into account the way the material is implemented. Formaldehyde surface concentrations of the building materials and furniture of the classroom at the beginning and at the end of the sampling period. Thanks to the previous results, the material sources were ranked at the beginning and at the end of the sampling period. To rank these data, the surface concentration Cas i of each material i was weighted by its surface S i in the room (Cas i x S i ) and expressed as a percentage of the total material contribution (∑(Cas i x S i )). The results for formaldehyde are presented in Fig. 3. Two main material sources are identified: the floor and the desks. As the desks are made of particle board, they are obviously a significant source of formaldehyde. If action by source reduction should be proposed, the replacement of desks would certainly be the easiest to implement, instead of removing the floor. Figure 3 indicates also that the source ranking is the same at the beginning of the sampling campaign (September 2012) and 4 months later (January 2013). Despite these numerous formaldehyde sources, the impact on indoor air quality is limited thanks to an efficient air exchange rate (3.3 h−1). The formaldehyde concentrations determined all along the sampling period did not exceed 15 µg m−3 in indoor air and are largely below the guide value of 30 µg m−3 which could be imposed by the future French legislation. Formaldehyde source ranking in the classroom in September 2012 and in January 2013. Another advantage of the DOSEC is the possibility to highlight VOCs adsorption/desorption on material surfaces. An example is given for α-pinene in Fig. 4. The main source of this compound is located outside the classroom, in the adjacent hall where the walls are covered by pine panels (see picture in Fig. 4). The concentration decreased in the classroom whereas the source (indoor air of the hall) remained nearly constant (the concentration in the hall was not measured during week 49). These data may suggest that α-pinene, and hence, other VOCs, can be deposited on the building material surfaces which may constitute VOCs sinks. To support this hypothesis, the Fig. 5 shows that there was a clear deposit of α-pinene on the PVC floor all along the measurement campaign: the concentration of α-pinene in the air of the classroom was 58 times higher than the surface concentration of the PVC flooring. Then, this ratio strongly decreased to reach 0.2 during week 4, meaning a concentration five times higher at the floor surface than in air. α-Pinene concentrations in the indoor air of classroom and hall and in the outdoor air—picture of the hall. Evolution of the ratio “concentration in air/concentration at the floor surface” for α-pinene. VOCs deposit on material surfaces is also reported by the literature where sorption processes are described through laboratory chamber testings [20, 21]. These processes are rarely identified in the on-site studies. The main reported influencing factors are the boiling point and the chemical properties of the compound, the physical properties of the material, such as the surface area, and the environmental conditions . Hence, Jorgensen et al. showed that α-pinene is better adsorbed by surface materials than toluene which is more volatile. They also demonstrated the adsorption of α-pinene on PVC flooring. The Fig. 6 presents the first modeling applications to formaldehyde in the different buildings studied. The indoor air concentrations were predicted according to the model described in the experimental section. The input data were the surface concentrations of all the building and furniture materials, the outdoor air concentrations and the air exchange rates. These results are promising, but modeling should be further developed and validated with more experimental trials. It could become a useful tool for decision making for IAQ management (ventilation conditions, selection of low emission materials). Correlation between predicted and measured formaldehyde concentrations in different building indoor air. Simple, sensitive and non-destructive methods to analyze VOCs and formaldehyde in indoor air and at the material/air interface were developed. They allow in situ measurements to study materials in their real environments, by taking into account the conditions for their implementation. DOSEC measurements also permit source identification and their ranking, and the quantification of adsorption/desorption processes at the material surfaces. A predictive modeling using these new measurements as input data was also developed as a decision making tool. If the first applications aimed to support IAQ management in new buildings, the methodology is easily transposable to cultural heritage to evaluate IAQ in old and new buildings (e.g. staff and visitors exposure), to study IAQ in showcases (modeling for design support, impact of building materials on IAQ), and finally to study the impact of IAQ on sensitive materials such as artworks, papers, paints, textiles, furniture or other cultural objects. VD was the coordinator of this work as the supervisor of the PhD thesis of DB, participated to the sampling campaigns and drafted the manuscript. DB carried out the experimental part of the study (sampling campaigns and laboratory analysis) and data exploitation within the framework of her PhD thesis. PM was the co-supervisor of DB’s PhD and developed the monozonal box model. HP contributed in results interpretation. All authors read and approved the final manuscript. The authors thank Nobatek and Christophe Cantau for his contribution to the selection of the buildings studied and information on building materials. They also acknowledge the buildings’ managers for allowing us access to their buildings. Competing interest The authors declare that they have no competing interest.